Our unique sustainable, 100% recyclable honeycomb board creates a technically sound void, solving ground movement issues and preventing structural damage caused to foundations by clay heave. Accredited by the BBA and specifically designed to work in commercial and domestic environments, the techincal properties of our environmentally friendly Clayboard void former system means significant savings in both time and money. Due to its unique make up, Clayboard creates very little compression and virtually no uplift, allowing for a lighter slab, less reinforcement steel. This void former also reduces soil excavation, muckaway costs and deliveries to the site as the product is 30% thinner than any other product on the market. Accredited by the British Board of Agrément. 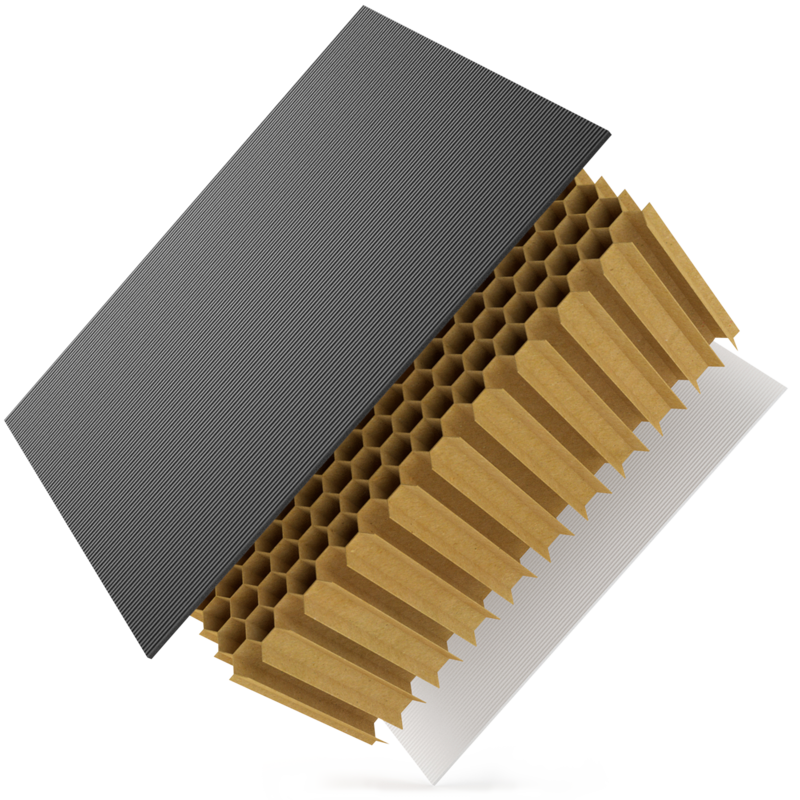 The honeycomb core is set between lightweight polypropylene facings and is installed on a polythene sheet in the foundation zone. Water is introduced after the concrete slab is set, which impacts the honeycomb, leaving a sound void that allows for natural ground movement to occur without exerting pressure on the ground slabs above. We work with structural engineers, builders merchants and contractors across the world to design and rollout environmentally friendly void former systems that have been tailored to their specific requirements. Available at resellers across the country, we can manufacture to a 3 – 4 day lead time and deliver direct to site in a weatherproof seal. Our team has many years of experience working on a range of projects, including everything from complex commercial developments to the New York subway system. For more information about Clayboard please click here. We like to deal with the market leading product manufacturers and the fact that we have been stocking and distributing Clayboard for as long as we have is testament to our relationship with Dufaylite. We always maintain healthy stocks of Clayboard, but there will be times when we need support with a speedy replenishment, and are quick to respond to quotation requests or questions about the product from our groundwork customers. I started to work with Clayboard on a number of sites about five years ago. I had been aware of other ground heave solutions previously, however after reading about the benefits of Clayboard on the website and getting to know Nigel at Clayboard, I realised Clayboard delivered numerous life cycle benefits to a project, plus it is technically a true void former. I am often in contact with Nigel. He is reliable and extremely knowledgable of the product and the industry. Clayboard is competitively priced allowing the site to retain the cost benefits from less land excavation and grouped prep, the level of service I receive from the team at Clayboard, the technical support of the product and the fast delivery times to site, help to ensure the site maintains i’s tight schedule. I used Clayboard for the first time on a residential site last month. After ordering with Trisha from Travis Perkins, I was very impressed as the void former was on site in a few days. I have used other ground heave solutions before but none of them had delivered a true void so I wanted to make sure I installed the product correctly. I had a quick look over the installation guidelines over a cuppa and I discovered the product was very easy to install. The product is lightweight and the act it comes on weatherproofed pallets makes my job easier wen it arrives on site. To speak to a member of our team or to find out more about Clayboard, please call 01480 215 000 or email us at clayboard@dufaylite.com.